Google has changed so many things, and scouting for a holiday home is certainly one of them. Our arrival at the houseboat had a strange air of familiarity about it, because I had "walked" down Jacob van Lennepkade on my own computer screen just the week before. 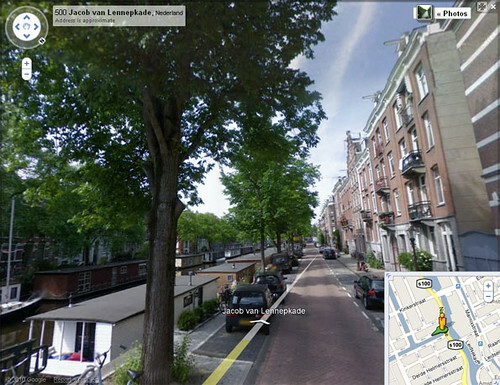 We had even scouted out the tram stop, and made note of which shops would tell us when it was time to get off. 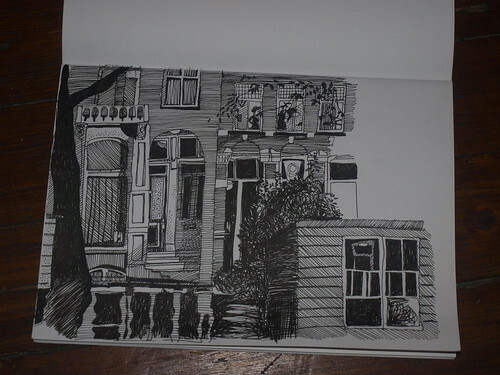 But best of all, when we arrived at the houseboat only to find no-one was there, I knew that just a few steps down the road there was a playstreet [speelstraat], so I was able to take Item off there while The Boy waited for our host to let us in. 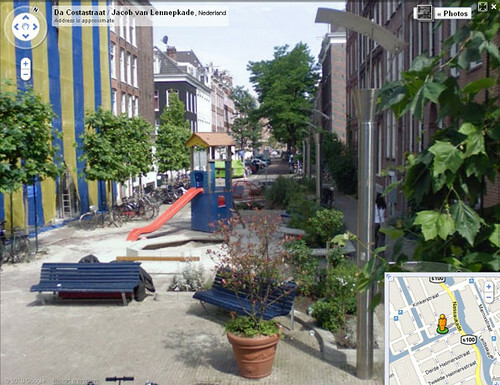 On Google Streetview, I'd assumed this was just a nice part of Dutch life, that they dotted play equipment around the town, but on closer examination, the Speelstraat would appear to be a local government initiative, in this case lobbied for by local residents. While it was mostly rainy while we were around, meaning that there were few other kids playing, you could see it was well used by the inhabitants of the flats in the tall buildings lining the play area. We weren't kept waiting for long: we were soon let into the houseboat and allowed to see our living quarters for the next seven nights. Very nice they were too. 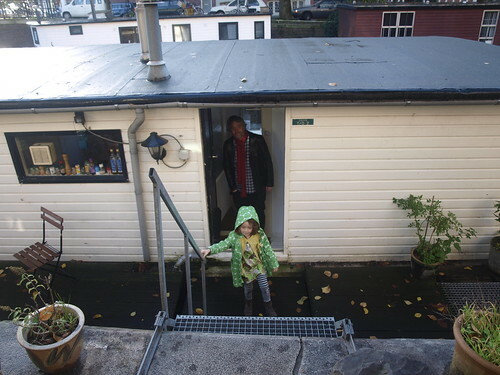 As we already knew from Streetview, the exterior of the houseboat was not a romantic one: it looked like a floating portacabin, as the majority of the houseboats we saw in Amsterdam did. 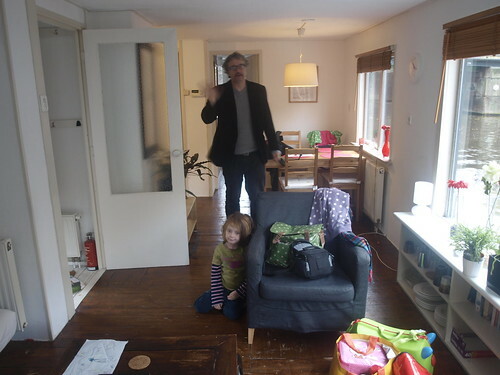 But inside, it was light, spacious and very pleasant. The Osiris is a one-bedroom houseboat; the sofa also converted into a bed. It felt spacious enough for our needs, although I would say that one the couple of occasions that Item had a tantrum, it would have been nice to have been able to let her work it through on her own for a bit - not really an option in such a small space. The boat didn't rock, as such, except when another vessel passed: occasionally one of the glass-topped tourist boats would go by, and we'd feel the aftershocks, gently, for a while. When there was no traffic, expectant ducks, geese and even swans would drift up and hint, as much as a non-verbal creature can, that they would like to be fed our stale bread. I mislabeled the most frequent visitor a moorhen, leading to The Boy's inspired decision that he was called Gordon ("Gordon is a moorhen"): Item was most distressed to learn that he was in fact a coot, so we returned him to moorhen status against all ornithological evidence. That afternoon, once we'd checked in, we went looking for lunch. We ended up at Sara's Pancake House on Raadhuisstraat, having jumped off the tram when we saw a street full of likely eating places. 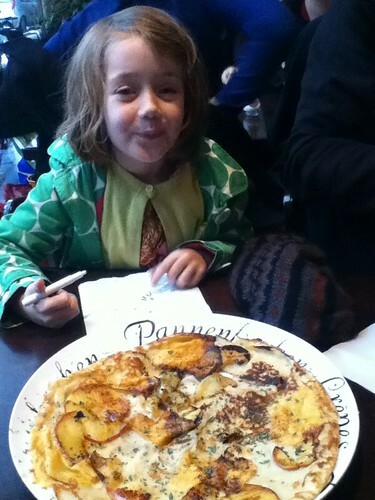 The pancakes were delicious: they had every sort, savoury and sweet, and I shared an apple and cheese one with Item. But my top tip is, don't sit in the seat right next to the door, which doesn't close properly and managed to irritate me throughout. Photo taken on my iPod. If the smile suggests pleasure in the food, it is misleading: Item did not eat any of this until I scraped all the cheese and apple off her bits! As we wandered around after our meal, I realised that we were within relatively close walking distance of one of our must-see sights: the Cat Museum (or Cat Kabinet). Counting off the house-numbers kept Item entertained as we walked along Herengracht canal in the rain, and we were all three of us delighted when we found the museum. Item is a cat-lover (to say the least), so she was always going to be satisfied. For The Boy and I, there was the added pleasure that every inch of the canalside house's walls was covered with posters showing great graphic design (and all, of course, of cats). Any fan of typography and design would have felt well catered-for, even if they had no special liking for felines. Item especially enjoyed an art installation consisting of a pinball machine in which a ballbearing ricocheted around ceramic maneki nekos (or lucky cats), making each one tinkle like a bell. But the absolute crowning and astonishing pleasure for her was that the museum is home to five real cats, cats who sit curled asleep on chaise longues around the museum, and are stroked all day long by visitors. If purring relaxes a puss, these must be the louchest moggies around. In the museum shop, we made our first profligate devil-may-care purchase of the holiday, buying three reproduction posters. REAL cat crazies could buy an entire set of 49. 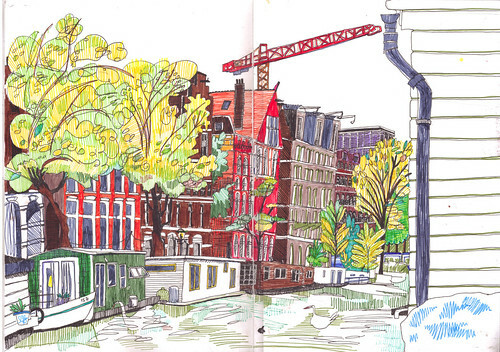 All in all, it made for a most unusual, and most pleasing, introduction to Amsterdam.